The St. Regis Bali Resort effortlessly blends the spirit of Bali with all the qualities you would expect from a luxury modern hotel. What brings guests constantly returning to the hotel is its direct access to a secluded white sandy beach, which is just a short walk from the grounds. It’s also located a short distance from the centre of town, where fashion boutiques and luxury fine dining restaurants await your attention. Spend the day exploring the stunning tropical grounds and the resorts’ large swimming pools or visit the Remède Spa complex where you can indulge in locally sourced oils and balms used for the massages. There are six restaurants and bars within the grounds to choose from. All with differing menus that help showcase an enormous array of international cuisine, as well as serving some delicious Indonesian specialities. At the Boneka, experience dramatic changes to the menu throughout the week. At breakfast enjoy the large selection of specially imported and local foods, such as ripened Bedugul strawberries, sashimi, shucked oysters, and tropical fruits all at the buffet. Dinner offers both an à la carte menu and all the culinary wonders of the St Regis buffet. Here you’ll find international and pan-Asian dishes, brought to life with creative twists and unique presentations. Open: 07:00 - 11:00, 18:00 - 20:00 and 12:00 - 15:00 for Sunday Brunch. Found in the one of the quietest corners of the hotel’s tropical grounds, the Dulang restaurant offers an intimate fine-dining experience. Housed within an ornate, traditionally carved gazebo, you will be welcomed with a drink of Jamu, handmade with indigenous herbs, before enjoying a beautifully crafted menu of Indonesian cuisine taken from the entire region. 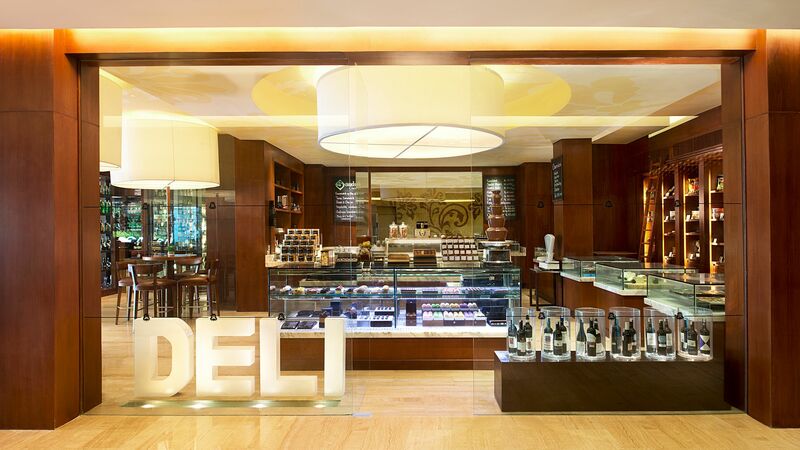 This gourmet deli is located beneath the lobby of the St Regis Resort and offers guests some of the finest delicacies, artisan foods and luxury boutique teas and coffees around. Visit the Gourmand Deli for endless browsing through their vast range of indulgent produce. 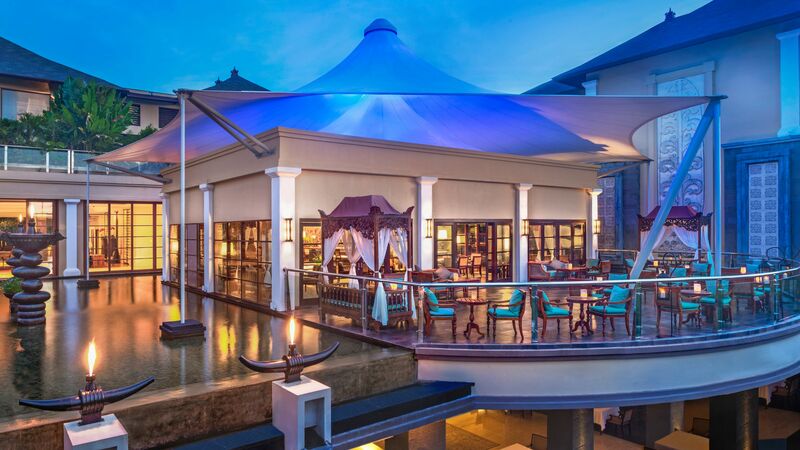 With intimate indoor seating set out by the beachfront, the Kayaputi is known for its unrivalled dining experience. Daily à la carte menus, premier caviar and oysters are available seasonally, and focus on Asian inspired Haute cuisine. Kayaputi is the winner of Wine Spectator’s Best of ‘Award of Excellence’ for the last eight years consecutively. Open: 12:00 - 17:00, 18:30 - 23:00 and 12:00 - 15:00 for Astor Diamond Champagne Brunch (Sundays only). The King Cole Bar treats guests to live jazz music every evening. Come to enjoy the music and traditional fire dance performances, and stay for the classic and contemporary cocktails, fine wines and champagnes. Stop by for afternoon tea and the international buffet corner. Two-tier stands of hot and cold dishes include a chocolate fountain. Welcome to St Regis Resorts’ picturesque beachside cocktail bar. 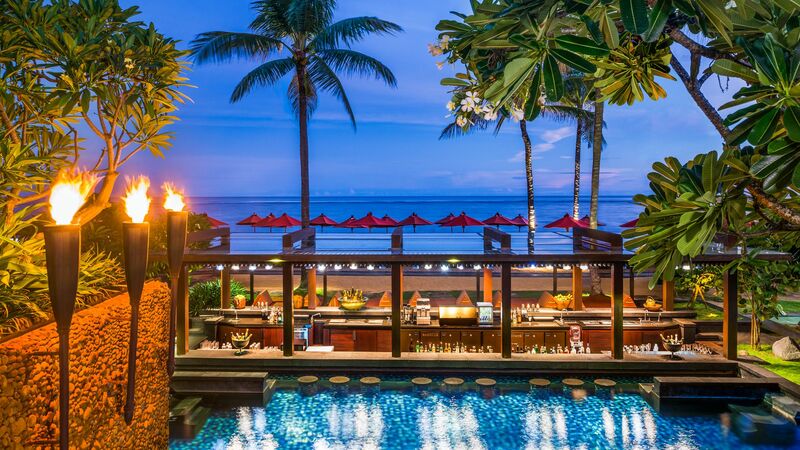 With a swim-up pool bar section and an open air interior bar, this is a great place to grab one of you favourite drinks and watch as the sun sets on the ocean. The Vista Bar is only open for hotel guests. While away the day at the St Regis Bali Resort’s enormous 3,668m2 salt water lagoon pool. The sun terraces are surrounded by beautiful gardens and palm trees, as well as luxury sun loungers and wooden gazebos to lounge on. There is also a shallow children’s pool for younger guests to enjoy. 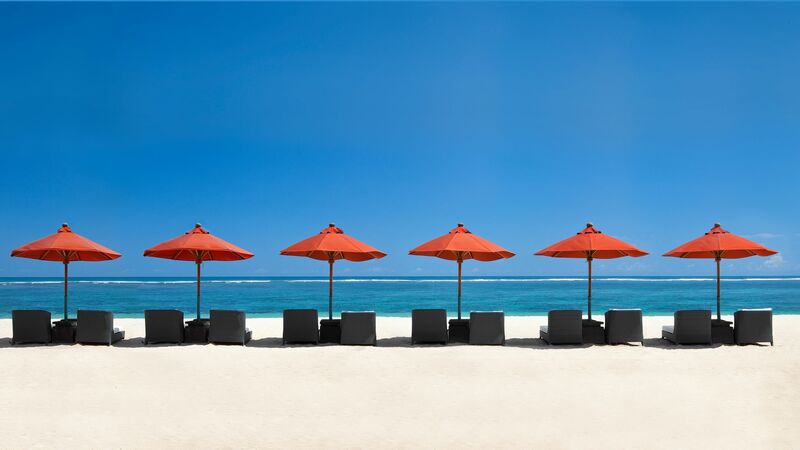 Bask in the glory of the Balinese sun in front of the Indian Ocean at the St Regis Bali Resort’s private beach. Complete with sun loungers, colourful parasols, and a full bar with waiter service. Younger guests are all welcome to join this interactive kid’s club. The main focus of the programme is to teach younger guests more about local and global cultures. This is achieved through music, cuisine, art and dance. 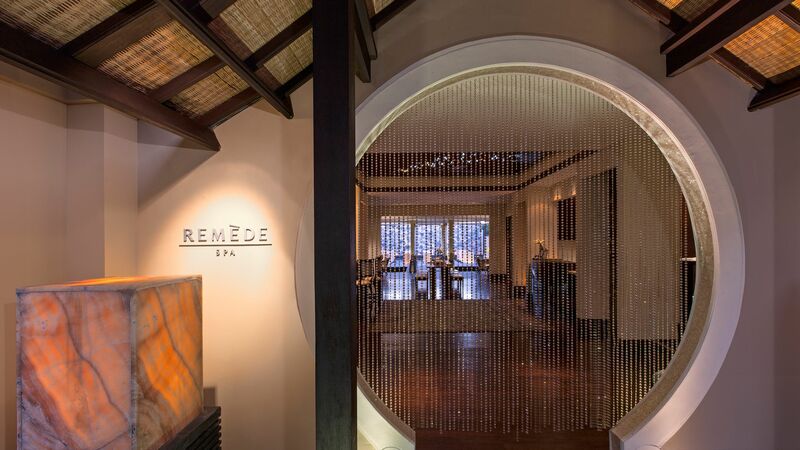 Taking the traditional healing techniques cultivated in Bali and fusing it with modern takes on therapeutic massage, the Remède Spa is the perfect place to relax and unwind during your stay. A wide range of locally sourced herbs are used to create the spa’s very own oils and fragrances for your satisfaction. 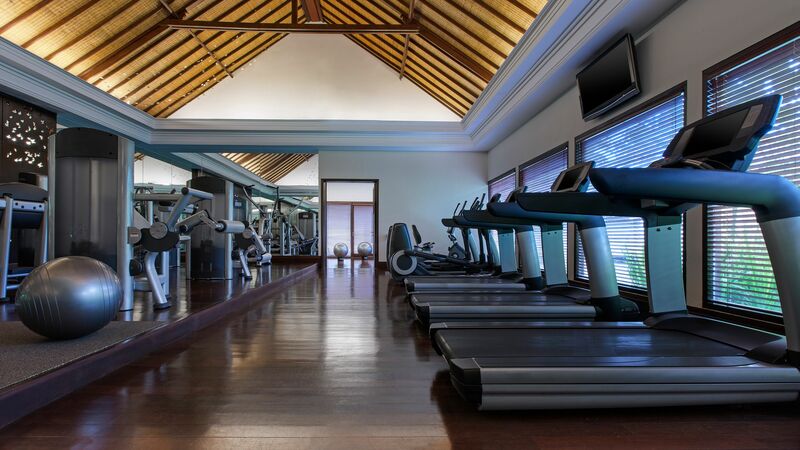 Within the spa complex there is a small but well equipped gym for guests. It’s open from 6am to 11pm and if you would like extended use of this facility, make a call to the 24-hour Butler Service for use after the gym’s closing. 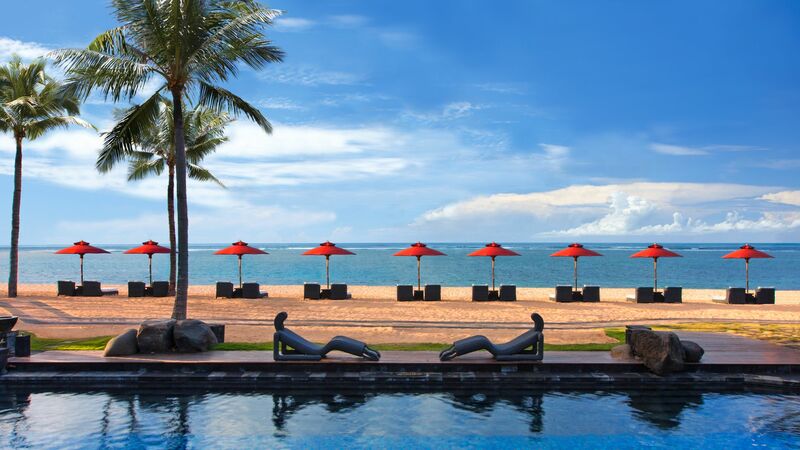 Nusa Dua beach is a beautiful patch of land located on a small peninsula on the south side of Bali. It’s purpose built for the ultimate luxury holiday, as well as offering some stunning natural surroundings. 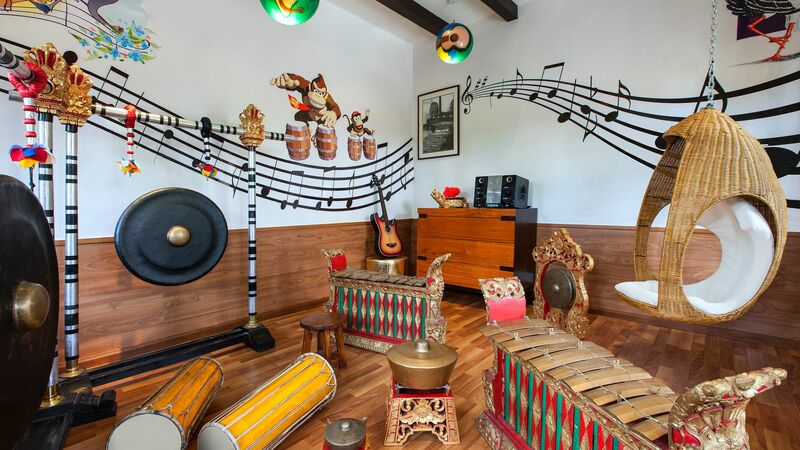 A multitude of luxury hotels, restaurants and bars can be found here, as well as an upmarket shopping centre and a museum dedicated to showcasing art rich in Balinese and Asia-Pacific influence. The beaches span as far as the eye can see, with a glorious haze of blue lapping gently against butterscotch sands. Pentai Menigat, the main beach in Nusa Dua, plays host to a natural reef just off of the shoreline, which creates calmer waters for swimmers, snorkelers or those who wish to simply wade and float. Further out past the reef there are more surfer-friendly waves to be caught. 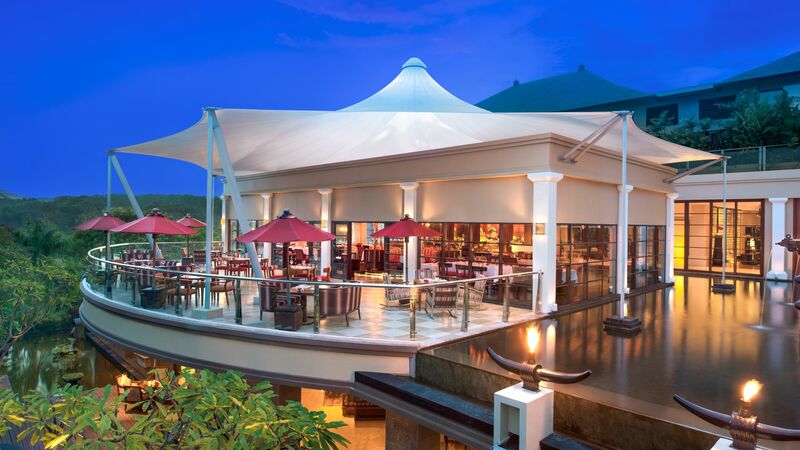 The St Regis Bali Resort is 25 minutes from Denpasar Airport. St. Regis Suites offer calming views over tropical gardens and luxurious amenities and furnishings that reflect the romantic culture of Bali. These luxury suites offer spectacular ocean views, bespoke services and spacious interiors with a 24 hour butler service on call to answer to your every whim. Orchid Suites offer plenty of space for the discerning traveller. A well-appointed living area boasts a dining table and comfortable sofa, while the large bedroom leads out to a large outside space where you can enjoy views over the exotic gardens. These large suites offer a peaceful, private garden where you can enjoy relaxing in your own pool. The interiors are finished in an opulent style with mahogany floors, tall ceilings and the finest amenities. Shaded by palm trees and exotic greener, and boasting their own private pool, these villas offer a truly superb experience of island living. Each villa features a luxurious bedroom flawlessly decorated, private terrace with gardens, private gazebo, dining and living area, powder room, walk-in closet, spacious bathroom with outdoor Balinese rain shower, fully equipped kitchen and a Bose® entertainment with iPod® docking station. 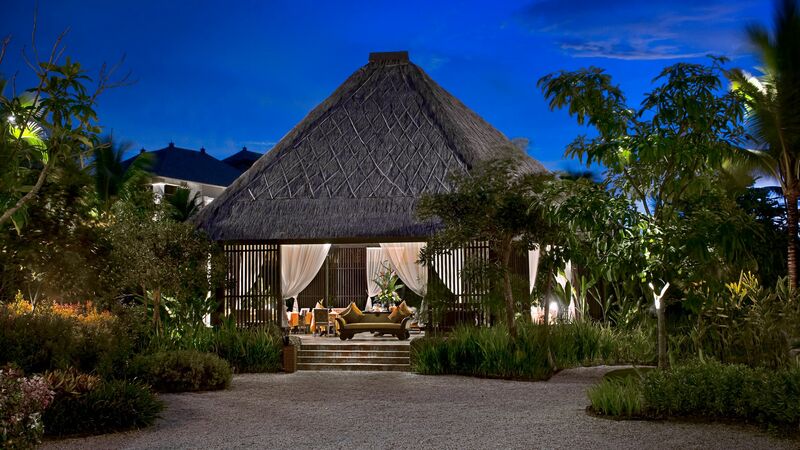 These spacious villas are nestled in the hotel's exotic gardens and are finished with elegant furnishings, high ceilings and mahogany floors. Ample outside space offers a private pool and direct access to the saltwater lagoon. Added extras include 24-hour butler service, complimentary fruit and mineral water and a complimentary daily wellness activity program at Remede Spa. Tucked away in the tropical gardens of the hotel and with direct access to the saltwater lagoon, these spacious villas are perfect for families. Enjoy your own private pool in the large gardens, sumptous furnishings and facilities inside and extras like a butler service, complimentary fruit and mineral water, complimentary daily wellness activity program at Remede Spa and free access to the Children's Learning Centre for those aged between 4 and 12. With beautiful outside space with a large private pool just steps away from the Indian Ocean, The Strand Villa offers the ultimate beachfront sanctuary. The one bedroom villa has been designed with detail in mind and guests can enjoy butler service and a complimentary daily wellness program at the spa. Save up to 20% discount on the hotel price for holidays between 01 April - 24 December 2018 and 11 January - 31 March 2019 when booked at least 120 days in advance. Save up to 15% discount on the hotel price for holidays between 01 April -24 December 2018 and 11 January - 31 March 2019 when booked between 60 - 119 days in advance. for holidays between 01 April 2018 - 31 March 2019. We have visited St Regis numerous times for lunch, brunch , dinner & cocktails.We love coming here as the atmosphere & ambience is truly beautiful. The staff are also equally fabulous attentive, efficient & friendly. We hope next time to stay at St Regis to explore the hotel more especially being able to enjoy the lovely clean sandy beach & awesome swimming pools. St Regis truly honours a 5 * hotel with it's outstanding facilities & restaurants. 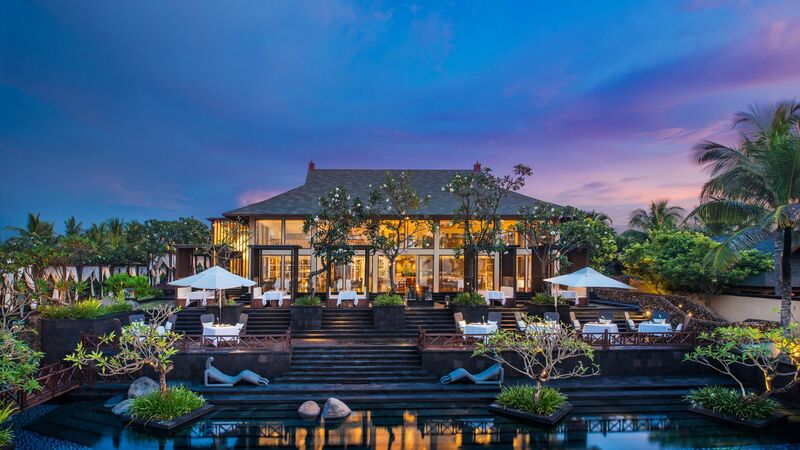 My wife and I stayed at the St. Regis Bali for our honeymoon and it was an amazing experience. The property is beautiful and perfectly manicured. We stayed in a villa which was huge. There was a lot of room to relax, and having your own private pool is very nice to cool down after being at the beach or getting a workout. I highly recommend springing for the villa if you can. The distinctive part of this property is the service. My wife and I both travel for business nearly every week and stay at luxury properties around the world. I would put the service at this hotel among the best in the world. The ratio of staff to guests was unbelievable, and by the 2nd day, the staff knew us by name. It was all-around an incredible experience - certainly one of the best hotels on the island! This may be the shortest review in history because this resort is really amazing. I had a Strand Villa which is gorgeous. My own beach access with chairs, an amazing pool and outdoor lounging areas, a big bathroom and medium sized closet, with a lovely living area and a comfy bedroom. There are plenty of mirrors, including a make up mirror, and the robes and slippers are very nice. The only thing I have to criticize is that there are not enough sockets to easily plug in appliances. That was sort of annoying. But the sockets they do have are universal, so no real need for plug adapters. The amenities are great with everything you need. I would list them all out, but you really don't need to bring anything except personal preference items. The bathroom is very well stocked. I wish there had been more fruit available in the room. I particularly liked the pens they make available. The coffee cups are too small, too. I used the gym which is empty except for the gym guy. It was perfectly acceptable except the temperature is too warm. It is pretty small, but it has all the machines you want except a rowing machine. I traveled all over the property using the golf carts or buggies are they are called. The service is prompt and completely adequate. Contacting the Customer Service people is easy and professional. They only forgot to send a buggy for me once. The gift shop is nice and I shot a game of billiards in the common area, but the table is not absolutely level so it was a challenge. How they keep anything nice with all the humidity is a mystery to me. The staff is attentive but they talk too fast and are hard to understand. The concierge arranged a trip out for me on a moments notice. I would totally stay here again. It is a classic and beautiful St. Regis property. I definitely have to say that this property has one of the best service I?? ?ve ever experienced!!! Carlos the butler made sure we had such a perfect stay, that we didn?? ?t leave the property for 4 days. On top of that he called the property in Hong Kong we were traveling next to make sure they took care of us. We are definitely coming back!!!! Thanks you very much St Regis Bali!!! This is our first visit to Bali. The St Regis is extremely attentive. They picked us up at the airport, but more than a ride. We were greeted by a representative before we got to immigration. He guided us to a special line and we were out in minutes. He brought us to an waiting area while he got our luggage. We rode in a beautiful new SUV. Ride to hotel was short, maybe 25 minutes. We were greeted by name at the guard house, then bellhops and of course at check in. Since we are here, every employee looks directly at us and gives a sincere greeting. This must be a slow time of year and we were upgraded to a fabulous room with a pool. Breakfast is included, it?? ?s a nice buffet. I?? ?m easy to please, when I ordered tea with milk they asked if I wanted hot or cold milk. Nice! Immediately headed down to the beach and had a nice lunch. Beach is extremely clean and I felt safe. They also have security guards around but it?? ?s not obtrusive. We are heading out on a cruise tomorrow and they will deliver us directly to the port.